One of the first rules of personal branding is to be authentic. 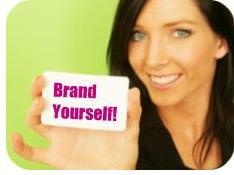 Personal branding takes being you to another level. Being authentic goes beyond thinking you know yourself to discovering the essence of who you really are, clearly defining personal attributes and aligning them with your career or business goals. I used the Reach Personal Branding assessment and analysis process to uncover my brand and now I offer it to my clients. Not only did the process help me zero in on who I am and my unique values, I discovered how others see me which is an equally important part of uncovering your personal brand. If you are going to brand yourself then you should be easily identified for what your brand represents. Let there be no confusion about who you are, what you have to offer, your mission or where you are going in your business or career. As one of the three essentials of personal branding, clarity helps you stand out and be remembered in the minds of your customers and colleagues. Find what makes you unique and ways to differentiate your brand image and identity from the competition. One of my business colleagues always introduces herself this way, ‘I ‘m the proud of ABC Company.’ She always does this with a smile while projecting a presence that clearly communicates conffidence and pride. It’s part of her elevator speech and can be found in her business profiles. In a highly competitive marketplace, careerists, professionals and entrepreneurs must find ways to get above the fray to be seen and heard. With an authentic message that is clear and communicates your conviction, the people who matter, will take notice. It is completely OK for your personal brand to reflect your passions or beliefs. In fact, it enhances your brand to participate in a cause or social action in which you believe. 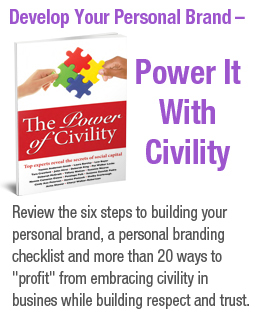 For me, civility is a core value and personal conviction that permeates my personal brand. Not only do I strive to make it part of my everyday life, it is intricately woven into the fabric of what I do with clients, colleagues, customers or even a stranger who enter an elevator I am riding. If you are passionate about saving endangered wildlife, promoting your cultural heritage, breast cancer awareness, or French cuisine, find ways to incorporate it into your brand. One of the best ways to be successful in personal branding is focusing on what you do best. While we may not be able to totally avoid those tasks or responsibilities that are not enjoyable, we are our best when doing what we enjoy and are good at. It’s what makes us shine and help us stand out in the eyes and minds of our audience, be it a supervisor, client, customer or colleague. Discovering your strengths and weaknesses is a useful exercise. It helps you choose a role, job, business endeavor or project that allows maximum use of our strengths and minimizes our weaknesses. For this activity, I highly recommend the books “Strengths Finder 2.0” by Tom Rath and “What’s Your Genius” by Jay Niblick. Check back soon for personal branding commandments 6 to 10. One Response to The Ten Commandments of Personal Branding – Part 1.